It’s been awhile since I read a graphic novel for review here (please note that the reviews often come out two to three months after the book has been read and the review has been written; and that they are not necessarily released in the order read/reviewed) so I digitally grabbed the first one available to me … something that I would have no pre-conceived notions toward … and read it. That book was Drifter, Vol 1: Out of the Night, written by Ivan Brandon and illustrated by Nic Klein. And I am hooked. The story starts out with a fairly common, if not over-used idea of a pilot/astronaut crashing on an alien planet. At one point I half expected to turn a page and see an Ape enter in the panel. There though, the similarity ends. The planet hosts a variety of alien surprises, though apes don’t seem to be among them, and that’s just fine. The planet holds a mystery (nay, mysteries) and we readers are no more ahead of the game than Abram Pollux, the only survivor of the crash. The planet is inhabited and ‘civilized’ in a rogue-ish, western, backwoods sort of way. He is rescued by a girl, who represents what might be considered ‘the law’ but might also be a bounty hunter. Pollux, alone, lost, and seeking answers, remains defiantly human and does things his own way, rather than trying to adapt to the rules of the planet, which only further complicates his alone-ness. This first book establishes some very interesting characters and sets up some a lot of questions with few answers. As a comic/graphic novel, author Ivan Brandon is clearly setting the reader up for a much longer story arc. While it is disappointing that there aren’t any completed stories within this 128 page graphic novel, there is enough intrigue here to keep me interested. Typically, I don’t expect a comic book to have a complete story in each issue, though it would be smart to compile each graphic novel so that there is some sub-plot story-line that concludes to give the reader some sort of closure. But the mysteries are set up very well, and I’m certainly interested in reading future issues in order to find some answers. These are well set-up mysteries and the characters odd enough to also keep us reading to learn more about them. The artwork, by Nic Klein, is beautiful and very much suits the story. There are graphic novels that you read and no matter how much you like the story, it’s still just a story. But this is one of the few books that really drew me, and had me fully engrossed in the world and its inhabitants, and has me wanting to keep reading. Looking for a good book? 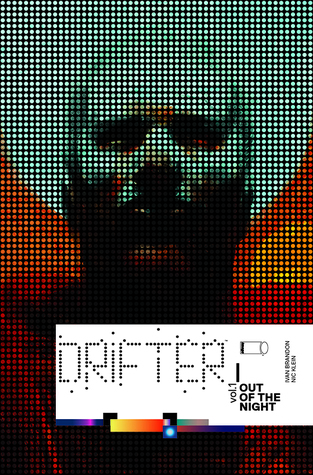 The graphic novel Drifter, Vol. 1 by Ivan Brandon and Nic Klein is a sci-fi mystery that has qualities of Shakespeare’s Tempest and draws the reader in with more questions than answers.